It looks like Starbucks is getting in the spooky spirit once again. They debuted a MCR-inspired frappuccino a few years back, and this year, they’re bringing the Halloween spirit to life in the spookiest way: With a Zombie Frappuccino, of course. The flavor was supposedly leaked by baristas, and it appears to feature purple, green and “gory” pink brains. (Because nothing screams zombie like “brains!”) According to Day Of The Human, it'll be a cream Frappuccino, blended with a “Green Caramel Apple Powder and Pink Powder” to give it a zombie-like feel. Not to mention the pink “brains” whipped cream and pink mocha drizzle on top. While we’re not sure how we feel about an uber-sugary green caramel apple flavor, we already know we’ll be camped out at some point in the Oct. 26-31 time frame to give the newest Starbucks flavor a try. 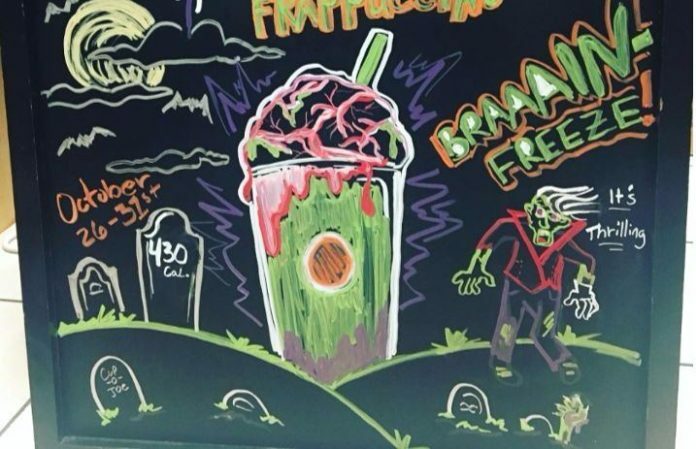 Would you dare try a zombie-themed frappuccino? Let us know in the comments below!